Energy is neither created nor destroyed, but it transforms from one form to another. In the NetEnt Sparks Slot, it has the potential of changing from spins into wins, and in more ways than one. Boasting two modes of play in which players can win one way or both ways, Sparks offers 20 pay lines of betting with improved performance on payouts. The game is a powerful concept from NetEnt that energises five reels with electrified gas filled neon symbols, supercharged Wilds and Expanding Cloning Wilds for one efficient slots prototype now fully online. Set in the miniature world of particle discharge and electric field phenomena, Sparks is NetEnt’s energetic 20 pay line slot that puts payout power in the palm of the player. Built for mobile responsive gameplay as well as desktop browsers, Sparks are flying everywhere with both the mobile slot Sparks Touch variant, and it’s online slot counterpart available at the best UK NetEnt casinos. Listed positives include dazzling graphics, clean-cut animation sequences and electrifying sound effects, plus incredibly flexible betting power ranging from 20p to £400 per spin. But what’s possibly most alluring is the Sparks Slot bi-play condition that can impact the games payout rate! With energy, it’s all positives and negatives, but more positive sparks are burning here. Whether you’re playing the Sparks mobile slot or the Sparks online slot, NetEnt’s premium stamp on the graphics detail is ever present. The game looks beautiful, it sounds like a dream and the playability value scores high, helped nicely by the “win one way or win both ways” option. We played NetEnt Sparks Touch for iPhone, iPad and two well known Android handheld delivery systems with great results, that’s another strength, it’s extremely mobile responsive. Desktop players can enjoy the well laid out control panel whereas the mobile slot design has the overlaying controls, both options work. During gameplay, Sparks spins its reels to a chilled-out melody that breaks to the powerful surge of spontaneous winning eventualities, and that’s exciting. Bet levels that cover the entire range and rewarding cloning Wilds backed up with two game models make the Sparks slot more than capable of entertaining. 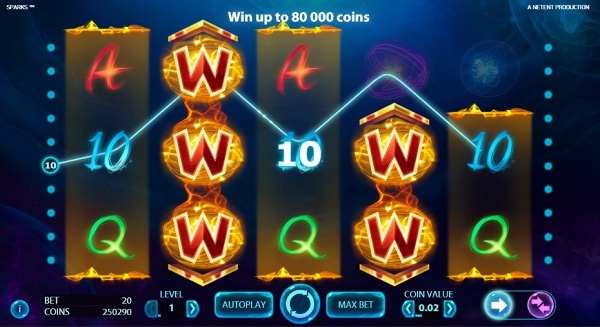 Both the Sparks Touch mobile slot and the desktop game use lower, medium tier and high-value bonus symbols to make up the paytable, each one carrying the energised neon theme design. Note, that depending on whether you play to win one way or win both ways, that the value of the Sparks Slot symbols will differ. The low tier symbols are card values 10, J, Q, K and A whereas five different coloured sparks are next up the payout food chain. The slots bonus icons are the standard Wild energised in blue and a more supercharged Wild in electric amber (found only on reels 2 and 4). All symbols float against NetEnt’s impressive 3D backdrop with all 20 pay lines displayed if selected. Unlike NetEnt Aliens in that players can leave the base game to explore winning capabilities in levels above, Sparks like the Starburst Slot is all within one level. 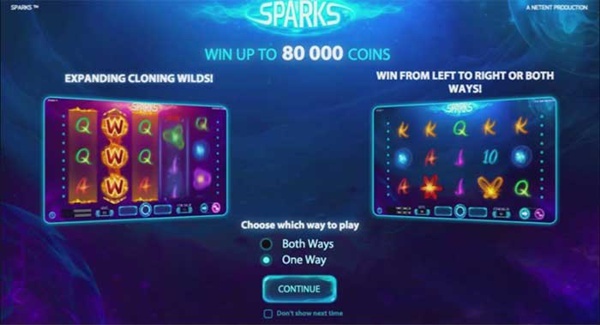 But Sparks offers players additional betting power with two modes of gameplay, notably the standard one way paying left to right and both ways that will catch payouts from right to left too. Sparks slot in one way mode has a blue background whereas the winning both ways game has a purple background. NetEnt Sparks exercises Expanding Cloning Wild technology and uses this characteristic as the slots main feature. Whether you’re playing the Sparks Slot for free or using real money to wager bets, all players will get to witness Expanding Cloning Wilds at some point. While normal Wilds are in play and found on all reels, Expanding Cloning Wilds feature on just reels two and four but are more powerful bonus icons. Find normal Wilds on the reels and they’ll substitute for other symbols to create wins. Find Expanding Clones and they’ll not only substitute for other symbols, but they’ll clone the symbols to the left and the right too. The best use of this feature is lining up two Expanding Cloning Wilds on reels two and four on the same line, effectively awarding you with 5 of a kind. You can play NetEnt Sparks for mobile or the online slot variant on a desktop from as little as 20p per bet. The game uses the 20 fixed pay line model, so all pay lines are in play for each spin. Coin values vary from 1p to £20 per betting line creating a spin cost of 20p to £400 per spin. The Sparks Slot is of low to medium variance and relies more on the frequency of wins as it does huge jackpots, a reason the Sparks Jackpot is as low as 200 coins. That being said, you can still win ‘Super Mega Wins’ during play without relying on large string symbol chains. The Sparks online slot has a payout rate (RTP) of 96.5% with a possibly improved outcome for opting for the “win both ways” mode of play. Betting limitations and payout rate remain the same for both desktop Sparks and the Sparks Touch Slot for mobile devices such as tablets and smartphones. We know that some of the most popular UK slots of the moment use free spins and multi-level bonuses at their very core, but Sparks uses a different grade of fuel. Forget the big bonus gimmicks and those rolling reels cross fed with multipliers, think more Starburst on steroids. NetEnt has re-energised it’s classic 20 pay line model and brought to life the next level of “win both ways”, and that’s optional by the way. Play the Sparks mobile slot (Touch) or the Sparks online slot (desktop) if you like good looking graphics, awesome sound effects, flexible betting options and explosive wins.